New Delhi: Jharkhand Mukti Morcha (JMM) and Congress on Thursday sealed their alliance for both the general and assembly elections. 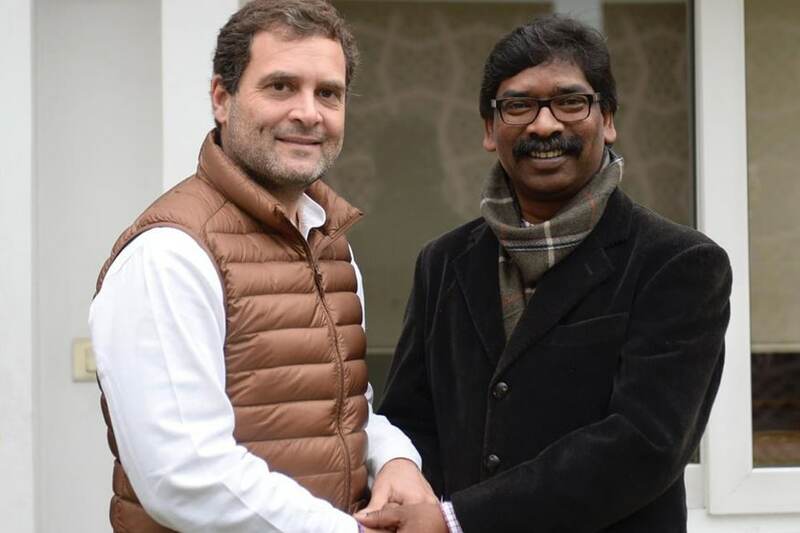 Apart from JMM and Congress, former Jharkhand CM Babulal Marandi’s JVM, and RJD too will be part of the alliance in Lok Sabha and Vidhan Sabha. According to sources, the two parties will fight the Lok Sabha polls under Congress’ leadership, and the assembly elections under the leadership of former CM of the state and JMM leader Hemant Soren. While Congress is expected to fight from greater number of seats in Lok Sabha, JMM is expected to get the lion’s share of seats in the pre-poll alliance for assembly elections. Together with the regional forces, Congress has set its eyes on getting a foothold in Jharkhand where it drew a blank in 2014 general elections. BJP, improving their tally from eight seats in 2009, had swept the state in 2014 winning 12 of the 14 Lok Sabha seats, the remaining two going to JMM. Congress which could win only one seat in 2009 was reduced to zero in 2014. Similarly, BJP has been going from strength to strength in assembly elections in Jharkhand as well. Up from 18 seats in 2009 assembly elections, BJP secured 37 seats in the last state elections. And it rose at least in some measure at the expense of Congress which from 14 seats in 2009 plummeted to seven seats in 2014. Congress, with the regional players, is hoping to push back the saffron party. And it has reasons to be hopeful. Of the three bypolls held in Jharkhand this year two were won by JMM and the third by Congress. Also, out of the seven bypolls held in the state since 2014, BJP has won only one seat. Having bagged the driver’s seat in the grand alliance for Lok Sabha polls in Jharkhand, which sends 14 MPs to the lower house of the Parliament, Congress will look to fight a tough battle against Raghubar Das-led BJP in the state.